One of the four suicide bombers behind the 7 July London Tube attacks which killed 52 people has appeared on a video obtained by an Arab TV station. In the message, broadcast on the al-Jazeera network, Mohammad Sidique Khan said he was "a soldier". Khan, 30, said the UK government had committed atrocities against Muslims and he was inspired by Osama Bin Laden. 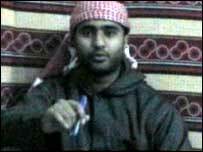 In a second message on the same tape, al-Qaeda's Ayman al-Zawahri claimed responsibility for the blasts. The eldest of the four bombers, Khan, who came from Dewsbury in West Yorkshire, was responsible for the Edgware Road Circle Line explosion which killed six people and injured 120. It is not clear when or where the tape was filmed. Prime Minister Tony Blair and the Foreign Office have not responded to the tape. Muslim groups and relatives of the victims of the bombings have expressed outrage at the message. On the tape the bomber said: "Our words are dead until we give them life with our blood. "I and thousands like me have forsaken everything for what we believe." He said the public was responsible for the atrocities perpetuated against his "people" across the world because it supported democratically elected governments who carried them out. "Until we feel security, you will be our targets," he said. "Until you stop the bombing, gassing, imprisonment and torture of my people we will not stop this fight. 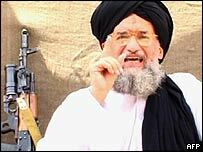 In a separate recording, al-Zawahri said the Tube attacks were a "slap" to the policies of Tony Blair. BBC security correspondent Gordon Corera said it was being examined closely for any clues on the 7 July attacks, in which three Tube trains and a bus were bombed. Counter-terrorism sources said they were not treating the messages as conclusive proof that the al-Qaeda leadership directly ordered - rather than simply inspired - the attacks, he said. He said: "I talk to you today about the blessed London battle which came as a slap to the face of the tyrannical, crusader British arrogance. "It's a sip from the glass that the Muslims have been drinking from. "This blessed battle has transferred - like its glorious predecessors in New York, Washington, and Madrid - the battle to the enemies' land," he said. He added they would target the "lands and interests of the countries which took part in the aggression against Palestine, Iraq and Afghanistan". Muslim Council of Britain spokesman Inayat Bunglawala told BBC News it was "obscene" to suggest justice for the people of Iraq could be obtained by committing an act of injustice against the people of London. "Holding all British people responsible for the Iraq war is just plain wrong - this country was bitterly divided and many millions, perhaps the majority, clearly opposed the war. "Mr Khan has allowed his hatred to distort his moral compass. "However, this tape does serve to confirm that the war in Iraq and our policies in the Middle East have indeed led to a radicalisation amongst a section of Muslim youth." Tory leadership hopeful and former minister Malcolm Rifkind said the "widespread belief" among some Muslims that the UK government's foreign policy was directed against Muslims was wrong. He told BBC News al-Qaeda and "other terrorists" were seeking to exploit the controversies aroused by the Iraq war to win recruits willing to carry out "savage acts". The Muslim boyfriend of one of the bomb victims condemned the terrorists' broadcasts as "wrong and all lies". Gous Ali's girlfriend Neetu Jain, a Hindu, was killed in the explosion on the No 30 bus in Tavistock Square. Mr Ali, who has studied Islam, said: "I just want to go on national television myself and expose their lies.